The fact that unions represent the legitimate interests of workers in the workplace should not blind us to the fact that labor unions, especially in Michigan, are large, prosperous establishments with hundreds of thousands of members paying millions of dollars each year in membership dues. Yet there is nothing about unions or their leadership that insulates them from the same sorts of misjudgments and ethical lapses that cause us to monitor the financial dealings of business or government. Unions across the country and in Michigan struggle under the burdens of waste and fraud. Workers who look to their unions to stand up for their rights in the workplace are discovering that too often their funds are being used not for representation, but for political campaigns they do not necessarily support. Workers who find themselves in this situation get little help from current union financial disclosure laws. While corporations are subject to stringent financial reporting requirements, the laws that dictate union disclosure are outdated and provide little of the "sunshine" that experience shows to be the best policy. Workers should not be forced to provide unions with millions of dollars of support based on little more than blind faith that this money will be used to defend their legitimate interests. 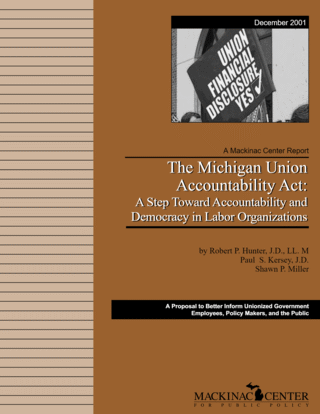 Annual accounting for and disclosure of union expenditures is a burden labor organizations should be willing to bear as a legitimate cost of doing business and as a natural consequence of the favorable treatment they receive under existing law. Unions that refuse to provide such disclosure should face stiff penalties, including the loss of membership dues or agency fees. Until unions are required to disclose their financial dealings, employees will be left in the dark about union dues and expenditures, and labor unions will continue to be easy targets for white-collar criminals and political opportunists.